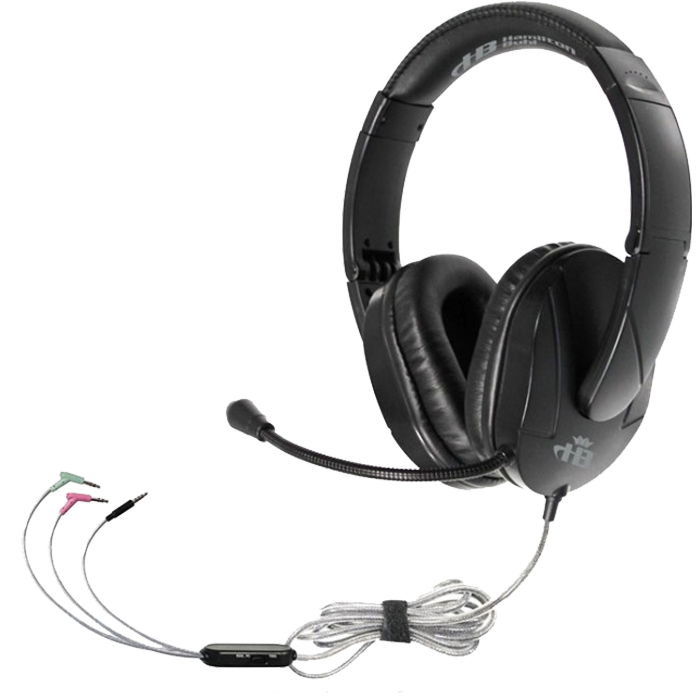 HamiltonBuhl Trios Headset - Headsets Direct, Inc. The HamiltonBuhl Trios headset is a headset made to fit the needs of any teacher, no matter what equipment you are using. Trios is unique in its design, as it will connect with any of your devices, whether old or new, PC or Mac, tablet, smart phone or a media player. HamiltonBuhl Trios uses a chew- and kink-resistant cord called a Dura-Cord on the Trios headset. The 5-foot Dura-Cord splits into the three plugs needed to connect to all devices making it a true multimedia headset. You won’t need to switch headsets anymore. The Trios headset is a headband over the head with speakers on both ears. The headband is padded, giving the students a little extra comfort. The headband also is foldable for storage. The ear cushions or ear cups are soft leatherette that are washable and replaceable. There is a volume control on the back side of the headset. The Trios style is deluxe over ear, and that means the ear cups are large enough to go around the ear of the students, so it seals in what you are trying to hear and seals background noise, so the students stay better focused. This can make a huge difference when assessment testing, improving test scores because they are not distracted, and they can hear better. The HamiltonBuhl Trios headset has a gooseneck microphone which is bendable and flexible, so you can get a good position in front of your student’s mouth, so their voices are picked up more accurately. The gooseneck mic can easily be wiped between uses to help promote a healthy classroom. The Trios also comes with a heavy-duty storage bag is makes it easy to hand out; no tangled wires. You can write on the bag, so you can put the student’s name or room number, making it easy to keep track of each headset. The bags are also anti-lice, so jut put the headset in the bag, and 24 – 48 hours later, the lice are dead without using any chemicals. The HamiltonBuhl Trios, a unique headset with different plug options on the cord making your life easier for connectivity. If you have questions on the HamiltonBuhl Trios or any other models, please give us a call at Headsets Direct 1-800-914-7996, or visit us online at www.headsetsdirect.com.